Several Syrian rioters, marking the 44th anniversary of the Arab “downfall” in the Six Day War (Naksa Day), were injured today when hundreds attempted to breach Israel’s northern border with Syria in the Golan Heights, near Majdal Shams. And, while Syrian authorities were claiming several fatalities, the IDF was unable to confirm this. Israel’s Channel 2 is reporting that five bus loads of protesters at Majdal Shams were bused in from the Yarmouk refugee camp near Damascus, where the Syrian security forces have full control. Further reports suggest that Syrian soldiers present in the area made no effort to stop people getting to the border and even engaged in provocation. When the demonstrators continued toward the Israeli fence, they said, shots were fired at their feet. “We know of 12 injuries,” she added. IDF forces were sending Arabic-language messages through loudspeakers over the border, warning that anyone approaching the fence would be stopped. Reliable IDF sources have informed us that, during the confrontations, the International Red Cross requested that the IDF hold their fire so Red Cross personnel could safely evacuate those injured, a request honored by the IDF. However, the rioters took advantage of the cease-fire and continued storming the fence. Though the Syrian media is reporting several fatalities, there is no independent confirmation of such reports, and the IDF spokesperson I talked to seemed skeptical that the injuries sustained by Syrian protesters could result in fatalities. A second demonstration took place on the Syrian border in Kuneitra, where 200 to 300 demonstrators amassed. Syrian protesters there hurled molotov cocktails towards IDF positions, but there are no reported injuries and the riots were successfully contained. Of note, there were no sign of the UN forces yet again – despite the fact that the Kuneitra demos were meters from their camp. Elsewhere today, hundreds rioted near the Qalandiya checkpoint north of Jerusalem. The Protesters were hoisting signs reading “A million shahids are marching in Jerusalem,” “The people want and end to occupation,” and “occupation is illegal,” and clashed with Border Guard forces, stoning them. A reporter from Israeli Channel 2 says there were 100-200 demonstrators at Qalandiya but stresses that most are members of NGOs rather than ‘authentic Palestinians’. 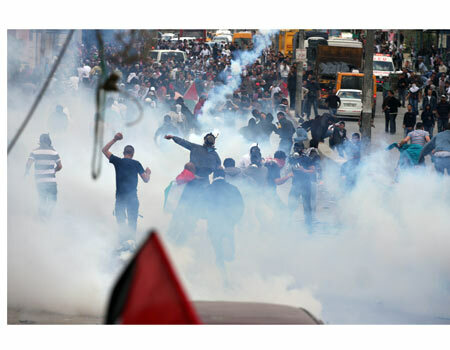 The IDF was able to use tear gas and other non-lethal methods to successfully disperse the crowd. One Border Guard officer suffered mild injuries. Finally, in Beit Hanoun, Gaza, this morning there were a few dozen rioters who approached the Israeli border but the situation was soon brought under control, by around noon, no injuries were reported and the fence was not damaged. Regarding the incidents on the Syrian borders, IDF officials were certain that the Syrian regime initiated the incidents in order to divert attention to the regime’s increasing brutality on Syrian civilians protesting the rule of Bashar Assad. Syrian regime the likely instigator? Er, could you possibly make a more obvious point? We all know the Syrian regime is strenuously trying to prevent the personal injuries of Syrian citizens and they don’t have the slightest interest to divert the world’s attention to the present events in Syria. Well, quite. That is the most obvious point I’ve heard in weeks. Sanity, well I am glad you agree with Adam’s point. If Arab regimes are expert at anything it is at the smoke and mirrors of deflection from what is really going on and at seeming to fight to the last drop of their people’s blood. may i suggest the israelis make the fences electric with warnings of course. Allowing themselves to be used as tools/fools on a bus to the border? They actually believe the government of Syria at this point is the least bit concerned about Palestinian cause. The tanks rolling into Hama? Do they marry their first cousins? What this article says of use: the Syrian regime is a brutal and murderous regime that is trying to distract from its current wide use of torture and murder by sacrificing a few useful idiots in the name of resistance and Arab nationalism. As an Arabist I heartily agree. What it does not say: the Golan are Syria’s rightful territory, stolen from the Syrian people and occupied in contravention of international law and human morality. Israel will ultimately have to give them back, to a dictatorship or a democratic government. Don’t confuse the evil Syrian regime with the bold and courageous Syrian people and nation. ‘Sanity’ – the Golan was not ‘stolen’. It was conquered by Israel in a defensive war and held in another one six years later after it had been used for years as an attack base against Israelis living below. Your beloved Syrians should have learned by now that if they start a war, there’s a pretty good chance they might loose it, and that has consequences. Funny how nations in other parts of the world don’t get territories returned to them on a silver platter after loosing them in a war they themselves instigated. Funny how people like yourself are so bigoted that they deem certain nations to be incapable of taking responsibility for their actions and decisions. The syrians i have met were urbane and educated on the surface – a surface that hid, in every case, a burning hatred for Jews. They learned it from infancy. I don’t believe for one moment that the regime forced their parents and teachers to bring them up that way. You’re an arabist you say? No-one has failed the arabs as much as the “arabists”. With friends like you they don’t need enemies. If you care about them what are doing wasting your time on here when you could be advising arabs how to turn their backs on nihilism and build a future for themselves? Er, so this is basically racist. I would suggest you retract immediately. Much of Europe is built on property stolen from Jews murdered by the Nazis with the almost complete collaboration of all of Europe. That did not occur in a defensive war started by Jews but was a result of a carefully planned genocide. Then of course there’s the massive amount of property stolen from Jews by the Arab world. And, given their vicious anti-Semitism, the Syrian people and nation are bold and courageous only in the same manner as the Poles, the Nazis and the Brits. Israel has annexed the Golan. It is now part of Israel’s territory, and while I personally am open to compromises elsewhere, it should never be given to Syria. The events of today show exactly why. If these violent would-be infiltrators were not stopped near Majdal Shams, and Israel had given the Golan to Syria, they would be trying to infiltrate the kibbutzim along the shore of the Kinneret and slaughter the people living there. The Syrian border has consistently been Israel’s quietest, so if you want to reward good beahviour, acttually returning the Golan makes a lot of sense. Perhaps wait a few weeks until there’s a less brutal regime in charge. Nothing says supporting Palestinian independence like writing paid articles in Brazil. This guy’s a real hero. Here you will see scenes from the Golan from today. 14 killed and 225 injured. Syria might be riding the wave, but the people have spoken. For the Syrians to stop them would be to repress them. Yes, it does conveniently benefit. But it did not plan for these people to go or put a gun to their head to do so. Israel is exercising its right and obligation as a sovereign country to defend its own borders. No more, no less. Israel as every other sovereign nation is defending its borders against violent attacks. I understand your frustration Joe but get used to it that anyone trying to breach our border will be seriously damaged. And when we say seriously we really mean it. Even your precious Guardian are reporting Hezbollah paying up to 900$ for activists to get injured by Israeli forces. The IDF, a much more reliable source than Syrian TV, has said that as far as it can tell, no would-be infiltrators were killed. They were shot in the legs by snipers. Your “score” of 14 dead (which, by the way, is hardly worth reporting compared to the dozens being killed every day in Syria by the Syrians) is simply the usual Arab propaganda, like the overblown reports of the “Jenin massacre” and Cast Lead. Whether the Golan Heights is legally or illegally held is a red herring. Why is the population of Syria suddenly actively concerned about this issue now, government tanks literally rolling over their population in other parts of the country should be of a more pressing concern (pun unintended) to the population….worrying about your neighbor while your family is killing you? How does this help their goal for regime change? Joe – have you commented elsewhere on the repression of the people by the Syrian government? Yeah, Israel decides which neighbouring territory it’s having and no one is going to stop us. It really is too thoughtful of you. Thank you so much for your contribution. I’m sure Ben White will cheer them. From far behind, or even better, far away. A real hero.